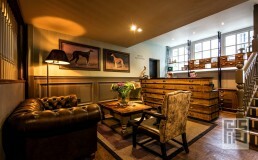 The Greyhound project has seen this prominent Carshalton High Street site, in Surrey, transformed. 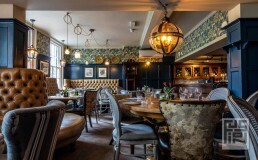 Fusion By Design worked closely with client Young’s over 12 months to respectfully enhance this listed Public House and dining rooms. The pub has overlooked the picturesque ponds of Carshalton since the 18th Century. 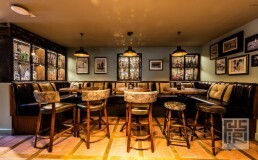 The concept for the scheme circulates around recapturing the spirit of the old coaching inn which was the original purpose of the building; providing refreshments and relaxation for travellers on their way into London. Our brief was to create more open friendly dining and drinking destination to attract a variety of the well-heeled local clientele. Within The Greyhound there is an original and listed bar called the Swan Bar. This has been totally transformed with the inclusion of new fixed seating formed around the opening of the windows and a smaller more decorative drinks bar. The scheme here is sympathetic to the original style of the room and with the view across the ponds it provides a wonderful place to rest and enjoy a meal and a drink. Within the main bar we have provided a variety of seating styles as the space is open throughout the day, serving coffee and breakfast to both hotel guests and passing customers and then drinks and snacks in the evening. The bar finishes include a timber and terracotta floor, with industrial metal shelving details and wine cages. The furniture is an eclectic mix of classic shaped furniture finished in leathers and textured fabrics in deep greens and mustard’s.